Isn't it glorious? It's so tacky, I love it! We put in a cheeky offer and were immediately outbid so we left it at that. I now wish I had've bid a little more. This kind of thing is not normally my style but the kitsch value here is quite significant. It would've been quite a talking point in my home. NOTE: I don't mean to offend any 'poodleana' lovers by calling it tacky because I also understand the charms of such objects. Beauty is most definitely in the eye of the beholder. What do other people think? I'm so torn on the poodle phenom! Mom bought a rather large pink stuffed 50's poodle about 15-20 years ago. But I've resisted collecting any more, much like I've resisted having a black and white checkerboard Diner style kitchen floor. A little TOO cliche`, in my opinion only!! LOL _ The whole poodle thing escapes me too though I have succumbed a time or two and brought one home. My daughter and I seek them out and call them "poodleabilia". Yours is a find. The last thing I had with a poodle on it was a red felt circle skirt when I was in the 3rd grade...but I do agree that a well-placed piece of kitsch can be fun. My daughter has the tackiest almost-lifesize gold cat you've ever seen, and she had it on her hearth. It was so awful it was cute. real life ones. They are more fun! I have left you something special on my blog. sharing it with all of us! Sorry for the late reply but work prevailed. 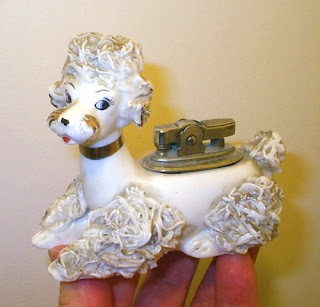 1950s - I've never heard of a stuffed poodle radio! I'll keep my eye out. DearHelen - poodleana/poodleabilia... I wonder if there's an official term for this stuff? Dana - That's what I mean. So tacky/kitsch that it's cute/cool. That was pretty much the thought process behind our flying wall ducks. Sara - Funny you have the same lighter!